Time travelling. The annual pass. I've been having fun receiving the annual natal congrats today. FaceBook has decided that a year after my 50th, I'm celebrating my 40th. Well, if it's on the internet, it must be true. Though @realDonaldTrump hasn't posted about is, so, it may not be completely true. Or it may be very true. Depending on where you get your fake from these days. Last time I was 40, I had an evening do in the Gelliwastad Club in Pontypridd, with the quartet playing, and lots of friends in black tie. This time was a much quieter day. 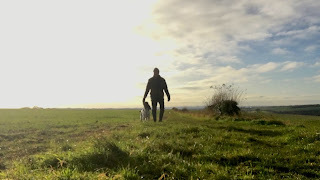 Harry & I had a good walk (see picture) in the November sun - and wind, which was quite cold; I baked; I went to see a Janacek opera. Janacek. There's a guy who knew a good time: "From the House of the Dead". An opera set in a prison camp. I tell you, I know how to celebrate being 40 again. Well, WNO are in Oxford for the week, so I'm going to the full set - Tchaikovsky, Janacek, Strauss. One of these is genuinely a bundle of laughs. Speaking of laughs, if I let myself, I could describe the whole experience of being 50 as interesting. In the Chinese proverb "interesting times" way, rather than in the "want to have more time being 50 so I can explore it and understand even more of it" way. More Janacek than Strauss. And then I'd have to add - as Stephen Sondheim so memorably said in a song I've enjoyed again this year in its West End revival - "Lord knows at least I was there, and I'm still here..."
Yet that doesn't quite hit the mark. I've had some fragile times this year. But I was also given the gift of a piano, and I've been playing it every day, sitting down and finding songs old and new to sing and enjoy. All sorts of songs, but at the start of each day - worship songs. It has been a wonderful gift to have this piano. It has kept me spiritually close to God, as such a gift should. And in my car as I've driven around, all sorts of music has healed my soul. Bach, of course. And Beethoven. And Basie. And Shostakovich - who knew? And most recently some old recordings of worship songs that Dan & Kirsty & I did together before they left Pontypridd. Just the three of us playing through songs and hymns. Simple, beautiful. I guess I'm saying - it's been a year. There have been moments of fragility. There have been touches of God. On my second visit to Florida this year I got an art piece which simply says "Rise'. Because every year, often every day gives the choice - is the cup half full or half empty? Which way are you going to see life? Which way are you going to let life see you? Sometimes it really does feel like Back to the Future, facing all the same old same olds all over again, and if the empty won before - how do we do this again? Because we rise. Because we have a God who rose for us and gives us the same power. Because it doesn't matter what age, what day, what mood we find ourselves in. This may just feel like a crucifixion day: but there's a rising coming. And I choose - now, today, always - to fix my eyes on the rising. To fix my eyes on Jesus, who for the joy set before him, endured the cross. As a Christian, I'm supposed to be able to do a little spiritual time travelling on a regular basis - and that's no Fake News. Because we're all supposed to need to look to Easter today in order to reach tomorrow.